There's no doubt that after an eventful (and exhausting) 2016, Taylor Swift has been cruising under the radar. But wherever she is and whatever she's doing, we are so sure that she is low-key loving the fact that both "yas" and "squad goals" are ~*officially*~ in the dictionary... sort of. 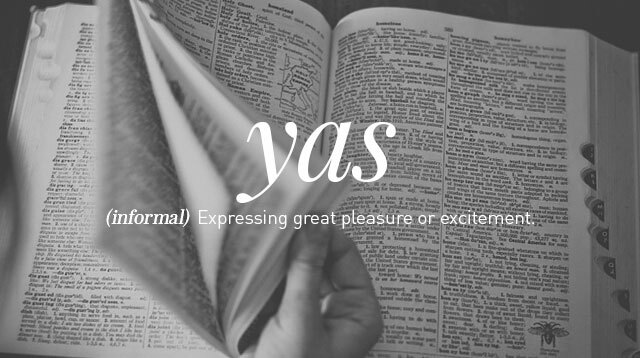 Our fave millennial words are part of the online Oxford English Dictionary. Unlike the more traditional printed dictionary, OxfordDictionaries.com keeps up with slang and hashtags. That said, so many other millennial-friendly terms have been added recently: "cringey," "haterade," "fitspo," "drunk text," and "femslash." We're guessing that last one is because of the current Fifty Shades craze, and we ain't complaining.